10 A None No Power Seat 10 A is a standard Business Class seat that may have restricted legroom due to the position of the bulkhead. The proximity to the lavatories and galley may be bothersome. 10 C None No Power Seat 10 C is a standard Business Class seat that may have restricted legroom due to the position of the bulkhead. The proximity to the lavatories and galley may be bothersome. 10 D None No Power Seat 10 D is a standard Business Class seat that may have restricted legroom due to the position of the bulkhead. The proximity to the lavatories and galley may be bothersome. 10 E None No Power Seat 10 E is a standard Business Class seat that may have restricted legroom due to the position of the bulkhead. The proximity to the lavatories and galley may be bothersome. 10 G None No Power Seat 10 G is a standard Business Class seat that may have restricted legroom due to the position of the bulkhead. The proximity to the lavatories and galley may be bothersome. 10 H None No Power Seat 10 H is a standard Business Class seat that may have restricted legroom due to the position of the bulkhead. The proximity to the lavatories and galley may be bothersome. 10 K None No Power Seat 10 K is a standard Business Class seat that may have restricted legroom due to the position of the bulkhead. The proximity to the lavatories and galley may be bothersome. 14 C None No Power Seat 14 C is a standard Business Class seat. 14 H None No Power Seat 14 H is a standard Business Class seat. 24 A None No Power Seat 24 A is a standard Premium Economy Class seat that may have restricted legroom due to the position of the bulkhead. The proximity to the lavatory and galleys may be bothersome. 24 C None No Power Seat 24 C is a standard Premium Economy Class seat that may have restricted legroom due to the position of the bulkhead. The proximity to the lavatory and galleys may be bothersome. 24 D None No Power Seat 24 D is a standard Premium Economy Class seat that may have restricted legroom due to the position of the bulkhead. The proximity to the lavatory and galleys may be bothersome. 24 E None No Power Seat 24 E is a standard Premium Economy Class seat that may have restricted legroom due to the position of the bulkhead. The proximity to the lavatory and galleys may be bothersome. 24 F None No Power Seat 24 F is a standard Premium Economy Class seat that may have restricted legroom due to the position of the bulkhead. The proximity to the lavatory and galleys may be bothersome. 24 G None No Power Seat 24 G is a standard Premium Economy Class seat that may have restricted legroom due to the position of the bulkhead. The proximity to the lavatory and galleys may be bothersome. 24 H None No Power Seat 24 H is a standard Premium Economy Class seat that may have restricted legroom due to the position of the bulkhead. The proximity to the lavatory and galleys may be bothersome. 24 K None No Power Seat 24 K is a standard Premium Economy Class seat that may have restricted legroom due to the position of the bulkhead. The proximity to the lavatory and galleys may be bothersome. 25 C None No Power Seat 25 C is a standard Premium Economy Class seat. 25 D None No Power Seat 25 D is a standard Premium Economy Class seat. 26 D None No Power Seat 26 D is a standard Premium Economy Class seat. 27 A None No Power Seat 27 A is a standard Premium Economy Class seat. 27 C None No Power Seat 27 C is a standard Premium Economy Class seat. 27 D None No Power Seat 27 D is a standard Premium Economy Class seat however, other flyers tend to bump into this seat. 27 E None No Power Seat 27 E is a standard Premium Economy Class seat. 27 F None No Power Seat 27 F is a standard Premium Economy Class seat. 27 G None No Power Seat 27 G is a standard Premium Economy Class seat however, other flyers tend to bump into this seat. 27 H None No Power Seat 27 H is a standard Premium Economy Class seat. 27 K None No Power Seat 27 K is a standard Premium Economy Class seat. 29 A None No Power Seat 29 A is a standard Economy Class seat whose proximity to the bulkhead may cause restricted legroom. 29 B None No Power Seat 29 B is a standard Economy Class seat whose proximity to the bulkhead may cause restricted legroom. 29 C None No Power Seat 29 C is a standard Economy Class seat whose proximity to the bulkhead may cause restricted legroom. 29 D None No Power Seat 29 D is a standard Economy Class seat whose proximity to the bulkhead may cause restricted legroom. 29 E None No Power Seat 29 E is a standard Economy Class seat whose proximity to the bulkhead may cause restricted legroom. 29 F None No Power Seat 29 F is a standard Economy Class seat whose proximity to the bulkhead may cause restricted legroom. 29 G None No Power Seat 29 G is a standard Economy Class seat whose proximity to the bulkhead may cause restricted legroom. 29 H None No Power Seat 29 H is a standard Economy Class seat whose proximity to the bulkhead may cause restricted legroom. 29 J None No Power Seat 29 J is a standard Economy Class seat whose proximity to the bulkhead may cause restricted legroom. 29 K None No Power Seat 29 K is a standard Economy Class seat whose proximity to the bulkhead may cause restricted legroom. 30 E None No Power Seat 30 E is a standard Economy Class seat whose proximity to the lavatories may be bothersome. 30 F None No Power Seat 30 F is a standard Economy Class seat whose proximity to the lavatories may be bothersome. 30 G None No Power Seat 30 G is a standard Economy Class seat whose proximity to the lavatories may be bothersome. 31 A None No Power Seat 31 A is a standard Economy Class seat whose proximity to the lavatories may be bothersome. 31 B None No Power Seat 31 B is a standard Economy Class seat whose proximity to the lavatories may be bothersome. 31 H None No Power Seat 31 H is a standard Economy Class seat whose proximity to the lavatories may be bothersome. 31 J None No Power Seat 31 J is a standard Economy Class seat whose proximity to the lavatories may be bothersome. 31 K None No Power Seat 31 K is a standard Economy Class seat whose proximity to the lavatories may be bothersome. 32 B None No Power Seat 32 B is a standard Economy Class exit row seat that has extra legroom however, the proximity to the lavatories may be bothersome. 32 C None No Power Seat 32 C is a standard Economy Class exit row seat that has extra legroom however, the proximity to the lavatories may be bothersome. 32 H None No Power Seat 32 H is a standard Economy Class exit row seat that has extra legroom however, the proximity to the lavatories may be bothersome. 32 J None No Power Seat 32 J is a standard Economy Class exit row seat that has extra legroom however, the proximity to the lavatories may be bothersome. 33 A None No Power Seat 33 A is a standard Economy Class seat that has extra legroom due to the missing seat in front. 33 C None No Power Seat 33 C is a standard Economy Class whose proximity to the lavatories may be bothersome. 33 D None No Power Seat 33 D is a standard Economy Class whose proximity to the lavatories may be bothersome. 33 E None No Power Seat 33 E is a standard Economy Class whose proximity to the lavatories may be bothersome. 33 F None No Power Seat 33 F is a standard Economy Class whose proximity to the lavatories may be bothersome. 33 G None No Power Seat 33 G is a standard Economy Class whose proximity to the lavatories may be bothersome. 33 H None No Power Seat 33 H is a standard Economy Class whose proximity to the lavatories may be bothersome. 33 K None No Power Seat 33 K is a standard Economy Class seat that has extra legroom due to the missing seat in front. 4 C None No Power Seat 4 C is a standard Business Class seat whose proximity to the lavatories and galley may be bothersome. 4 H None No Power Seat 4 H is a standard Business Class seat whose proximity to the lavatories and galley may be bothersome. 43 A None No Power Seat 43 A is a standard Economy Class seat that may have restricted legroom due to the position of the bulkhead. The proximity to the galleys may be bothersome. 43 B None No Power Seat 43 B is a standard Economy Class seat that may have restricted legroom due to the position of the bulkhead. The proximity to the galleys may be bothersome. 43 C None No Power Seat 43 C is a standard Economy Class seat that may have restricted legroom due to the position of the bulkhead. The proximity to the galleys may be bothersome. 43 D None No Power Seat 43 D is a standard Economy Class seat that may have restricted legroom due to the position of the bulkhead. The proximity to the galleys may be bothersome. 43 E None No Power Seat 43 E is a standard Economy Class seat that may have restricted legroom due to the position of the bulkhead. The proximity to the galleys may be bothersome. 43 F None No Power Seat 43 F is a standard Economy Class seat that may have restricted legroom due to the position of the bulkhead. The proximity to the galleys may be bothersome. 43 G None No Power Seat 43 G is a standard Economy Class seat that may have restricted legroom due to the position of the bulkhead. The proximity to the galleys may be bothersome. 43 H None No Power Seat 43 H is a standard Economy Class seat that may have restricted legroom due to the position of the bulkhead. The proximity to the galleys may be bothersome. 43 J None No Power Seat 43 J is a standard Economy Class seat that may have restricted legroom due to the position of the bulkhead. The proximity to the galleys may be bothersome. 43 K None No Power Seat 43 K is a standard Economy Class seat that may have restricted legroom due to the position of the bulkhead. The proximity to the galleys may be bothersome. 45 A None No Power Seat 45 A is a standard Economy Class seat. There is no overhead storage due to cabin equipment being stored here. 45 B None No Power Seat 45 B is a standard Economy Class seat. There is no overhead storage due to cabin equipment being stored here. 45 C None No Power Seat 45 C is a standard Economy Class seat. There is no overhead storage due to cabin equipment being stored here. 56 B None No Power Seat 56 B is an Economy Class seat in the last row of the aircraft that may have limited recline. The proximity to the lavatories may be bothersome. 56 C None No Power Seat 56 C is an Economy Class seat in the last row of the aircraft that may have limited recline. The proximity to the lavatories may be bothersome. 56 H None No Power Seat 56 H is an Economy Class seat in the last row of the aircraft that may have limited recline. The proximity to the lavatories may be bothersome. 56 J None No Power Seat 56 J is an Economy Class seat in the last row of the aircraft that may have limited recline. The proximity to the lavatories may be bothersome. 57 D None No Power Seat 57 D is a standard Economy Class seat however, the proximity to the lavatories may be bothersome. 57 G None No Power Seat 57 G is a standard Economy Class seat however, the proximity to the lavatories may be bothersome. 58 D None No Power Seat 58 D is an Economy Class seat in the last row of the aircraft that may have limited recline. The proximity to the lavatories may be bothersome. 58 E None No Power Seat 58 E is an Economy Class seat in the last row of the aircraft that may have limited recline. The proximity to the lavatories may be bothersome. 58 F None No Power Seat 58 F is an Economy Class seat in the last row of the aircraft that may have limited recline. The proximity to the lavatories may be bothersome. 58 G None No Power Seat 58 G is an Economy Class seat in the last row of the aircraft that may have limited recline. The proximity to the lavatories may be bothersome. 81 A None No Power Seat 81 A is a standard Business Class seat. 81 C None No Power Seat 81 C is a standard Business Class seat whose proximity to the lavatories may be bothersome. 81 H None No Power Seat 81 H is a standard Business Class seat whose proximity to the lavatories may be bothersome. 81 K None No Power Seat 81 K is a standard Business Class seat. 82 A None No Power Seat 82 A is a standard Business Class seat. 82 C None No Power Seat 82 C is a standard Business Class seat. 82 H None No Power Seat 82 H is a standard Business Class seat. 82 K None No Power Seat 82 K is a standard Business Class seat. 83 A None No Power Seat 83 A is a standard Business Class seat. 83 C None No Power Seat 83 C is a standard Business Class seat. 83 H None No Power Seat 83 H is a standard Business Class seat. 83 K None No Power Seat 83 K is a standard Business Class seat. 84 A None No Power Seat 84 A is a standard Business Class seat. 84 C None No Power Seat 84 C is a standard Business Class seat. 84 H None No Power Seat 84 H is a standard Business Class seat. 84 K None No Power Seat 84 K is a standard Business Class seat. 85 A None No Power Seat 85 A is a standard Business Class seat. 85 C None No Power Seat 85 C is a standard Business Class seat. 85 H None No Power Seat 85 H is a standard Business Class seat. 85 K None No Power Seat 85 K is a standard Business Class seat. 86 H None No Power Seat 86 H is a standard Business Class seat whose proximity to the staircase and galleys may be bothersome. 86 K None No Power Seat 86 K is a standard Business Class seat. Complimentary beverages are provided on all flights. Snack and meal service varies depending on the length of route. Meals are offered on all long-haul flights. This aircraft is configured with 67 flat bed Business Class seats, 32 Premium Economy Seats, and 272 standard Economy seats. Row 29 is the best seat row in Economy. There is no solid bulkhead in front but a large gap to the last row of Premium Economy. Huge legroom. 83K is indeed one of the better seats. 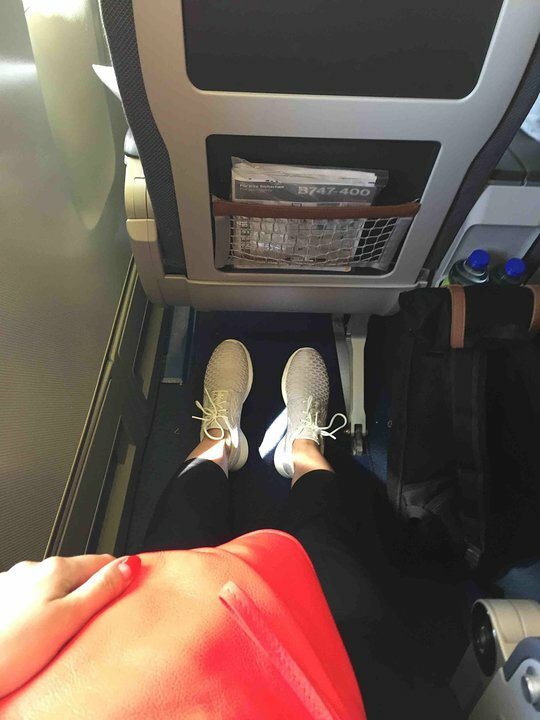 The window seat gives you more room for your feet than the aisle seats. 83K also has room for a small bag on the side - which the other business seats on the upper deck do not offer. 29C and all of row 29 is exactly as others have commented. No bulkhead, just a lot of space between this row and Prem Eco row in front. I'm rethinking about posting this - I really don't want anyone to nab this seat! The back of the seat can be tilted backward only limited because of the wall behind. When the aircraft is parked, it is very warm because the air conditioning is not or not sufficiently cool and the waste heat in the rear area is very high. When the plane departs and during flight, the aircondition solves the problem. The legroom is very limited, the table is only half foldable (if you still want to breathe). If the front man folds his back, it becomes completely uncomfortable and you feel like a sardine in the can. If you're tall (6 feet or more) you will find more legroom if you pick a window seat (A or K) as there is a ledge underneath the window where you can put your feet when the bed is in the fully-flat position. The aisle seats force your feet into a narrow pocket that is quite uncomfortable. Row 85 A and C are good picks because you do not have anybody behind you who kicks or slams their feet down on their foot rest waking you up. Also it is away from most galley and lavatory traffic. The only drawback to the upper deck is the WC situation. The upper deck plan shows 2 lavatories ...... However, 1 is reserved for the cockpit crew and is separated from the upper deck by a door and not accessible. This means that 22 passengers must share this tiny toilet or go down to the main deck between rows 4 and 10 and look for a vacant WC. Lufthansa has done a great job of keeping the 747-400 updated. The business class seats are high tech and very comfortable. Flights from SEA FRA and return in seats 2A and 2C were great in all respects. Location means that you are served first and there is no traffic to rest rooms except for row 1. That row is also a good location except it is a bit narrower and the screens are mounted on the bulkhead. The food and service on these flights were excellent, a standard that others should adopt. I had seat 24F. There was enough space. Because of the bulkhead, there was little bit more legroom and it was much easier to come to your seat, so your neighbor didnt need to get off his seat. The overhead box for carry-on baggage was smaller, than the other ones, so it was hard to insert the full-size carry-on baggage of seat 24F and 24G. The proximity to the onboard kitchen didnt bothered me, because there were no noises and no smelling. I would go on this seat again, if i would have the opportunity. The central aisle seats have the most foot room. There are four seats across, but only three footwells, so the two seats in the middle share a footwell. The footwells on the aisle seats are oversized. You might end up sharing part of that with a middle seater, but if you don't it's much easier to stretch your legs. The aisle seats in the window section have reduced size footwells. I had one of those on another flight. Absolutely the best seating arrangement! The business class seat for this flight from Frankfurt to Mumbai had ample space as described and is almost flatbed recline. Comfortable and recommended...Unless you can get yourself a window on the upper deck! All row 43 on this flight was an "infant" row, with room for 4 bassinets in total (one left side, one right side, two middle). Good legroom (I am not very tall) but no support for feet. IFE system and tray table are in the armrest. Any luggage must be stored for take off and landing. The plane is rather old. Row 29 on Lufthansa's 747-400 is without a doubt the best row in Economy. It's the first row in Economy, directly behind Premium Economy. Leg room is more than ample, and there is no bulkhead wall or partition or even a curtain which would reduce your legroom, so the comments about 'restricted legroom' are completely inaccurate. The IFE system and tray table are in the armrest, so it's true that width is slightly reduced, but only slightly, and it's more than made up for by all the extra legroom you have. I would prefer this row even over the exit row in Economy. All seats in row 29 have extended legroom, there is no bulkhead in front - I think these are the best seats in the economy cabin apart from the emergeny exit seats. It is also worth noting, that the premium economy cabin is in a 2-3-2 configuration. Because of this, seats in row 29 have all their video screens in the armrest, making the seat somewhat narrower. I'm not sure why people state that the business class seats are not lie flat, because they most certainly are 180 degrees flat. I agree that they are narrow as is the foot rest area. 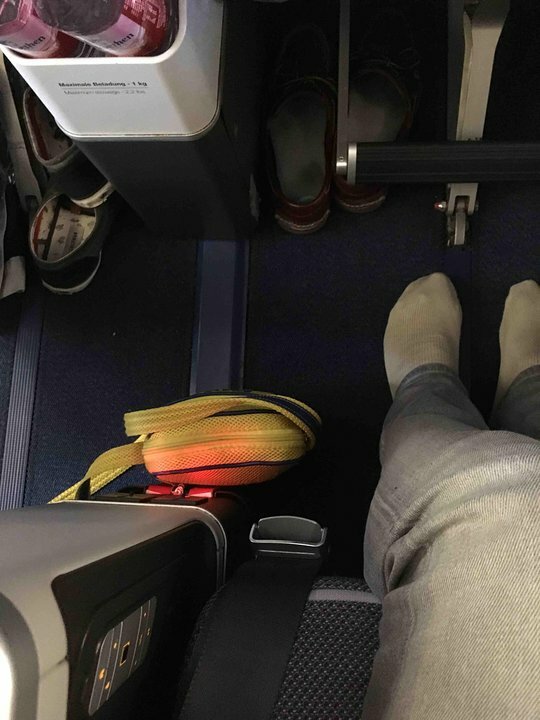 For max foot space, on the upper deck the seats in row 84 have a larger foot well as they are part of a bulkhead and not a seat in front of them. I also flew in 85 A/C on LH447 - same aircraft. These seats are pretty much standard Biz class fare, but are arranged 2-2 on the upper deck. This is getting out of date as many airlines are now configuring Biz class with all aisle access in 1-2-1 type configs. However, I don't see how this would be possible on the upper deck of a 747, but LH still does 2-2-2 on their Airbus. While better than economy, I would chose a better seating arrangement if available such as AC or UA new Polaris. Seats are barely ok.You do have a little extra space to stretch.Seats are very narrow,not comfortable.Lavatories are very small and uncomfortable to use. Service on this flight was non existent.Apart from meals,no crew member was seen.Plane is rather old, food was gross and very small portions.Thankyfully we had had dinner at the airport before boarding, would have been very hungry otherwise. Coffe for breakfast was served after we were already done with the sandwich, and only one serving.We definitely wouldn´t recommend this flight in economy. I forgot to mention that those sitting in the business cabin should be careful about putting anything next to the armrest. I made the mistake of leaning my iPad against it as I fell asleep and woke to find it missing. A frantic search later found that it had slipped to the space behind the seat! On the return flight, the crew made a point of telling every one NOT to put their i-anything next to the armrest for it could be crushed by the seat and start a fire! The seats in business class for flight from Denver to Frankfurt are better than I thought. They are lie-flat, not angled, but still quite narrow. There was only one toilet, however. Row 29 is the first row of the economy section and the space between the last row in Premium Economy (27) and this row 29 is tremendous. Much more leg space than in Premium Economy. Lufthansa charges a supplement for this row which is still much less than Premium Economy. Contrary to whatever Seatguru says, there is NO bulkhead. Separation to Premium Economy is done by a minute partition at the roof. You will not be able to reach beneath a row 27 seat with your feet - and I measure 1,93 meters. Seat width is normal economy of course but the leg space is what matters here. Toilets are behind you, no disturbance from that side neither. We flew this plane on August 2017 from Denver to Frankfurt (LH447 - D-ABVO "Mulheim a.d. Ruhr"). The flight was very good, except for a take off turbolence because of bad weather conditions. Those seats are very good if you are two people: you can be alone and not disturbed by third persone. You have also a great space more apart between your seat and the window. The seats are comfortable, with a personal enterteinment device like on all other Lufthansa planes. The engine's noise is something important, but all seats you choice behind the wing hear loud noise. This B747 is 21 year old, but the interiors was been revamping and now you can stay in a comfortable plane. Also the legs' space is more then on a Airbus. Those seats are near the rear WC and if you're tired you can walk on the little rear gangway next WC. In Feb 2017 I flow from Frankfurt to Osaka on JAL in business. It was great. Last month, July 2017, I flow on Lufthansa 740 from Frankfurt to Osaka. It was by far the worst Business class experience I've had in the last 5 years. Horrible and a complete waste of money. The business class seat would have been good 7 to 8 years ago but in 2017... horrible. There is little difference between premium economy. Unlike JAL you can't go fully flat. Horrible. Bulkhead row of Premium Economy is very nice. A curtain is pulled for the whole flight so you don't see or hear anything in the galley ahead. The wall prevents you from stretching out completely but the bulkhead seems to have more leg room than the other PE rows. The tray table and entertainment system reduction don't seem to reduce seat width. It's a comfortable seat but otherwise, PE is the same economy food in ceramic dishes and actual glasses. An excellent seat, but the bed length of 78" and recline angle of 180 degrees is misleading. The bed length may be 78" from the top edge of the seat rest to the footwell, but I'm 6'4" (76") and the bed is way too short for me. Anyone over 6' tall will find their feet crammed into the footwell. Also, the seat does not recline to 180 degrees - more like 150 degrees. I sat in the 27E from Vancouver to Frankfurt. The premium economic sit is good, you have more place, you can recline the sit more, but its not a wonder as i imagined that would be. Yes, it is definetely better than the normal economic class, but if you sit at the economic row 29, y are fine! Plenty of legroom here. The only disadvantage is that the seats are a little narrow as the tray table is in the armrest. Flight from FRA to KIX. Can agree to earlier comments: The upper deck offers some more privacy than the main deck. 2 flight attendants for 22 guests ensure very good Service. However, as said before, the floor is shaking when people move and you feel this. The LH flat bed seats are long but fairly narrow. For the window seat, you have some extra foot/ leg room. Reasonable storage space is also available below the window (but no closed bins). Entertainment System at LH has a lot of options (e.g. 100+ movies) with good headset. Mark as yellow. In this aircraft 45abc overhead locker blocked off used to store baby bassinet so hand luggage has to go in overhead somewhere else nearby. Lufthansa has updated this route to a newer business class seat. Seats 10E, 10G, 11E, 11G, 12E, 12G, 14E and 14G are significantly inferior seats. The arm rest between is shared and is small. The foot week is significantly smaller than seats A, C, D, H, K. The seats should be yellow. The thing you need to remember with the seats on the upper deck is that the access to the flight deck is there and the lavatory is also forward. There is literally someone walking by every 15 minutes and the floor gives and shakes your seat when they walk (often not softly) by. That said, the seats were super comfortable, the service was excellent . With 2 flight attendants on the deck, you are likely to get served first as all of the food and drink carts are stages for service in the gap for the exit doors right in front of the seat. Not Recommended. All the seats in that entire row 42 doesn't recline like other seats. Bad experience. On Lufthansa flights from Vancouver to Frankfurt the row 29 has a lot of leg room (more than premium eco). That's why they sell them for additional money. Weird that those seats are marked as bad seats here. Though the seata are four across, the are only three under-seat storage spaces so passengers on full flights will have to share the space. Let's hope their fellow travelers are considerate. 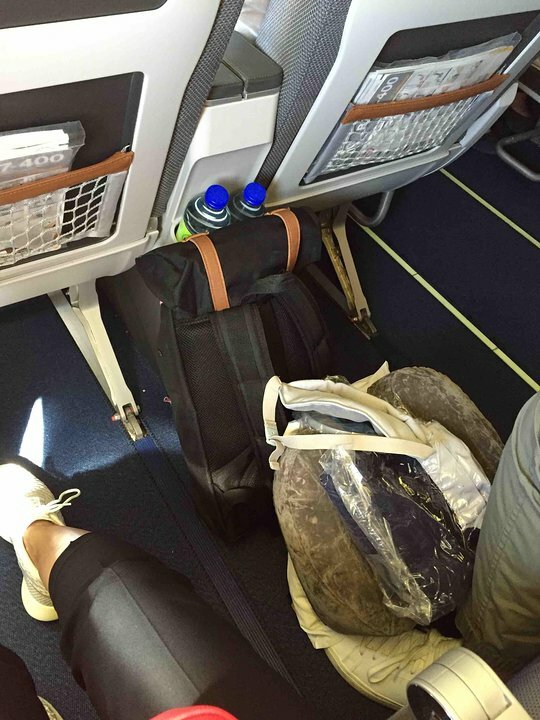 This is a bad seat for anyone who wants to rest during the trip because the hand luggage compartments at this location are for the exclusive use of the cabin crew who are constantly loading and removing luggage from there. While rows 1 and 83 are probably my favorite for this plane, 85A was really nice. Just like row, 83, there is no one right behind you, only a shelf. Foot traffic is also low, because the lav is at the front and the flight attendants set up their service in the exit row between rows 83 and 84. Lufthansa offers a really well rounded service. Echoing the good rating for seat 29K -- and the entire 29 row, for that matter. Huge legroom. There were a couple comments about there being a bulkhead here which actually restricted legroom, but that was not the case. Rather, in place of a bulkhead or curtain, there is simply a split in class, with the seats in front are 'premium' economy. Well, they might have been wider than my economy seat in 29K, but they had far, far, less legroom. I had the privilige to sit in seat 29K for 10 hours between FRA and SEA and it was better than I had expected. Ok, the seat was quite narrow but that´s Economy Class. The table and personal entertainment screen was the folding type, which can sometimes be quite annoying. But this was compensated by great legroom. Placed just behind the last row of Premium Economy seat 29K had suprisingly good legroom. So much space. Awesome! From SEA to FRA and back, 1C over and 2c back. Was a bit disappointed that a -8 wasn't on this route, but this airplane had been refurbished and looked like new. Really comfortable seats and all gadgets worked fine. A toss up between rows 1 and 2, main difference is that the screen is on the bulkhead for row 1, and a swivel screen from the seat divider for row 2. The overhead storage issue that another reviewer mentioned wasn't a problem for us. These are very quiet locations as the galley and restrooms are aft. And you get served first. And that service was excellent. The seat was on the aisle and had more room than I needed to be very comfortable. All the electronics worked well - seat adjustments, screen, etc. 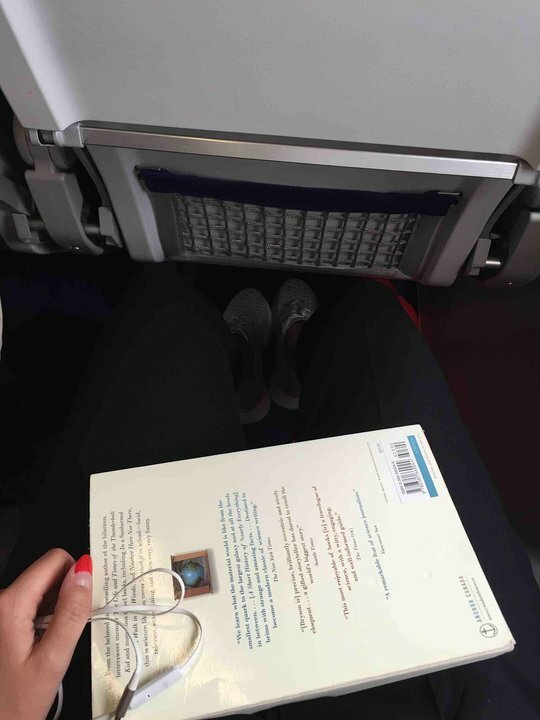 Only complaint was, for a business class seat, there was a poorly designed shelf for belongings so they kept falling out and onto our feet. Just a lip on the shelf would prevent that. The plane start to be narrow from line 49 or 50 but the corridor is same (left side of H seats), so in the line 53 the 3 seats are about 10 cm smaller together than a standard economy seat. Furthermore the legroom in 53K is divided to two parts (1/4 - 3/4) by the leg of 52K. I guess the 53A is same. I do not recommend to anyone. I flew in seat 1H in Business Class from FRA to IAD. The seat should be marked "yellow" for caution as has no overhead storage. There are no overhead bins for the 1st row and the two closest bins are undersized, due to the curvature of the plane, meaning very little room being shared by up to six people in three rows. In addition, the wall-mounted AVOD screens are slightly smaller in row 1. We were booked in PY for the flight but on checkin at the airport were offered an upgrade for $300 each which we took. We were upstairs which I found a little cramped with the windows quite low to see out of. A good flight with a good sleep but the catering ex YVR was really mediocre. I had probably the worst tenderloin ever. So overcooked, it was like boot leather! Not sure what plane (or version) folks are on, however LH advertises this row for an extra $150 (or $100 depending on day of ther week as "extra" leg room. In fact, SeatGuru is right: it's a "knee knocker". I have pre-paid for this seat previously and when I checked in was told that "There is no extra leg room" in this row. Traveler Beware NOTE: Rows 29 (DEFG) are normally reserved for families with infants (fold-downs for basinets). If you can't endure crying young ones you may reconsider this row. Row 29 was delightful, Plenty of legroom. My wife could not touch the seat in row 28 with her legs fully extended. Close to WC, seat in row 28 could be fully reclined without intruding into your space. They all were like this once upon a time. Row 29 offers plenty of leg space and there is no bulkhead. Seats 29DEFG offers even more leg room. This was a good seat because it's only one of a very few in economy where you can have a window with only one other person sitting next to you. You get bonus legroom because there are only two seats in the row in front of you, with extra space on the left. Plus, you basically have four windows to see out of. If you're concerned about the time to deplane like I was, it's only about 10 minutes. It's also reasonably close to the lavs at the back. Seat 24C in premium economy was great. On day of check-in, it cost 300 Euros to upgrade and was well worth it. Better seat, service and food. I wish more airlines would make Premium Economy like this, both more leg room AND wider seats. Business class on the airplane is great. Comfortable lie-flat seats and good food. seats are a bit narrow though. 83A YVR-FRA and 2K FRA-YVR I would recommend booking in the upper deck but the nose is fun as well. I was upgraded from premium economy and this was my first time in a lie flat bed. The seat is right in the nose of the 747 so I believe it is on a slight angle. With this in mind, you might want to raise your head portion of the bed when you try to sleep. I didn't find the bed that comfortable and didn't sleep much but I think it was because my head was lower than my feet. Other than that, it was a nice seat and the service made up for a previous bad experience with Lufthansa. Bulkhead seats 1A, B, C, and D have far more open space for your feet and very quiet as nobody is walking past you to/from the restroom. LIkely the best option for a couple traveling together. I flew FRA to Seattle on 22 April and had booked initially a Premium Eco seat. A few days prior to departure I submitted a request for upgrade through Lufthansa myOffer, which got accepted 48 hrs prior to departure. When boarding I found that Biz class was only half full, Pr Eco full and Eco was almost full too. Excellent service and seat 86K is wonderful (although for a night flight the sometimes loud galley chatting of some of the crew may be bothering). IFE is excellent too. Seated on upper deck was a very intimate experience and very quiet. The B 747 I was on does however gives a "worn" impression. This was not my first Biz class experience so can compare with some others. I would give LH almost a 4 on a scale from 1 to 5. I flew to New York on the new 747-8i and thought that the seat was ok. I was supposed to be flying back on an A380, but a few weeks before, it was changed to a 747-400. I was upset as I believed that the seats would not be as good. It turns out that they are actually better! They feature the brand new screens in economy, which are higher resolution and extremely fast and responsive. The older ones, you had to push really hard into the screen in order to get it to respond. My flight on the older Jumbo actually turned out better than the new one! Due to the change from 3 to 2 seats per row in row 54 the outer seats (54B and 54J) are separated by a gap of roughly one foot from the cabin wall. Being displaced from the window impacts the view to the outside and also there is no wall you can lean against (the only position I can sleep in in Y-class). On the upside there is plenty of space for your luggage between these seats and the cabin wall and you gain plenty of legroom as you have an extra foot of space to your left and you can stretch your legs diagonally underneath the outer seats of row 53 (53A and 53K) which makes 54A and 54J a good choice for tall passengers. 27G is the last row of PE in this configuration, and as such, due to the 2/4/2 setup, seats D and G protrude slightly into the aisle compared the the Eco row behind. This leads to trolleys and passengers bumping into the seat on the way through. Also the entire row is slightly narrower than the rows forward - very slightly reducing seat width compared to the remainder of the PE cabin. Seat 4D is absolutely the best seat on the entire plane if you are traveling alone. You also get 2 amenity pouches in that seat, as well as access to either aisle side. Instead of sitting at an angle, you also sit straight. You also get a large wall on the right side to shield you away from the door, aisle, other passenger and anything else. If you are hesitating over Premium economy, the seats in row 29 have more legroom and are 70 per sector. Is it worth paying whatever the Premium costs for an extra inch width and a pre-take off glass of orange juice? I didn't think it was. Sat in seat 33K. With no seat in front of you, there is lots of leg room. You can even sneak out through the small gap between seat 32J and the exit door, without bothering those in seats 33H and 33J. Premium Economy is worth every penny, the extra legroom is great but it is the extra width that makes the long flight to and from Vancouver bearable. There are few extra services, though friendly and prompt - but there is an amenity kit hidden in the arm rest (socks, eye cover, tooth brush, etc.). 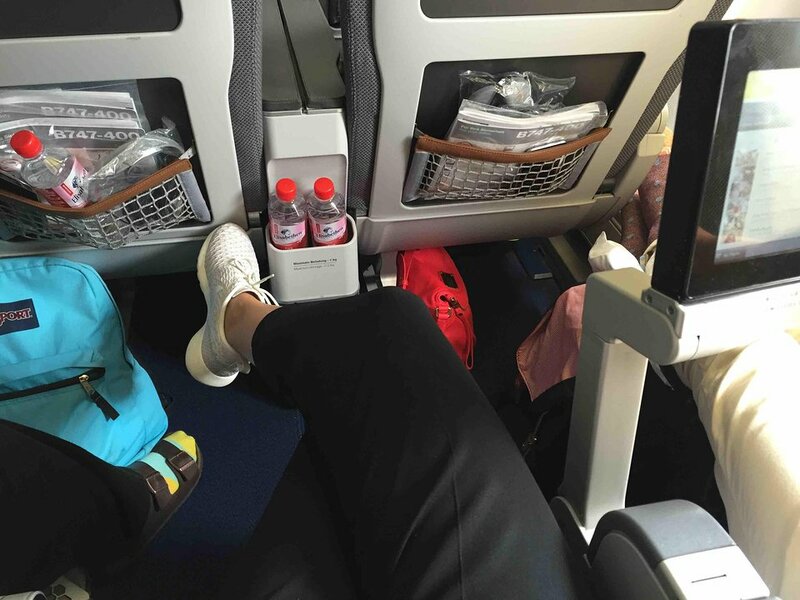 The large divider between the seats holds the tray table and can be a bit inconvenient to climb over and the down side is that it can't be raised if the seat next to you is open and you want to stretch out. If I could always have seating like this I wouldn't dread overseas flights. Some extra legroom would be really good. The 37A economy class seat was horrible. Narrow and old. Flew on this configuration from KIX to FRA. I highly recommend the Window seats in row 55. Since there is only half a seat in front of you, you get lots of space for storage and legroom. I could even leave the seat on the walkway between the fuselage and my seat without disturbing my neighbor. Additionally you get 3-4 windows to look out. The only downside is that the overhead compartment is used to store medical equipment. Lufthansa flies 2 versions of Boeing 747-400 V3.